I traveled earlier this week and stocked up the house with food for my husband and son before I left. When I came home, the three beautiful pears I left for them to snack on sat in the fruit basket ripened beyond the point of wanting to eat them. Darn. 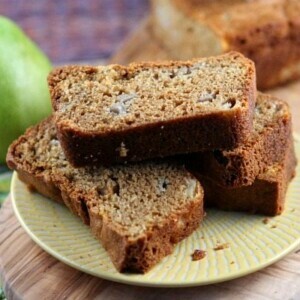 All turned out okay though since I remembered I had been wanting to try this recipe for pear bread. It was Thursday night… and it was a good chance to make a breakfast treat for the upcoming weekend. As I write this now (Friday night), we have one of two loaves left! 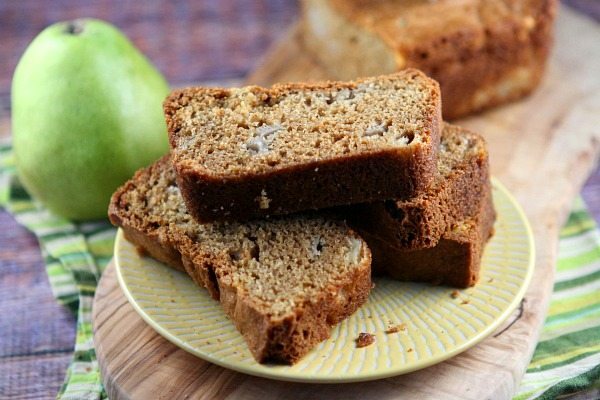 A nice alternative to banana bread, fresh pear chunks are dotted throughout this spiced-up quick loaf. It doesn’t matter if your pears are near mush. 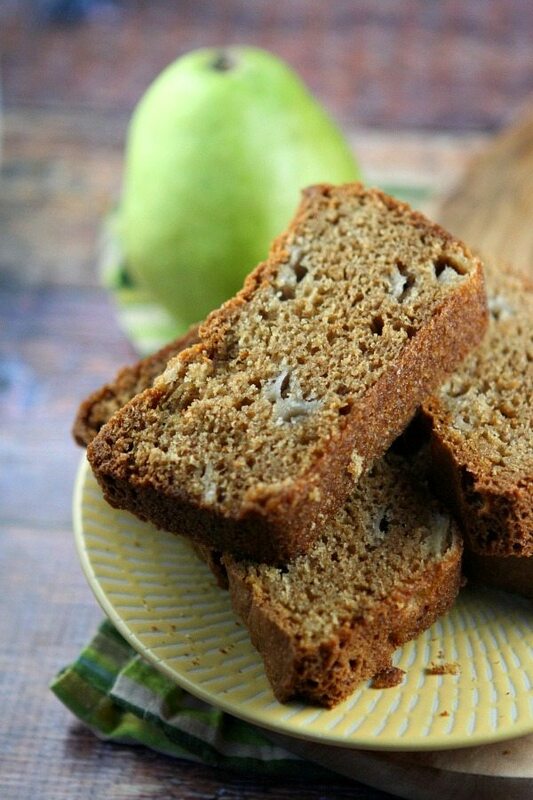 Turns out mushy pears are perfect for pear bread. 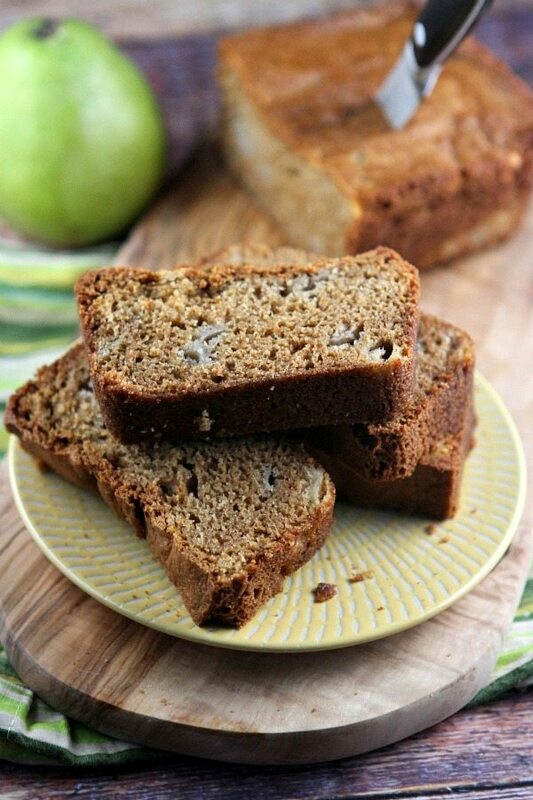 I chose to lighten the loaf a bit by using 1/2 applesauce in place of 1/2 cup oil (so… 1/2 cup oil + 1/2 cup applesauce). You won’t see any difference in flavor if you do it that way. The applesauce keeps things moist just as the oil does. 1. Preheat oven to 350°F. Lightly grease two 8x4-inch loaf pans. 2. In a large mixing bowl, combine oil, sugar, eggs and vanilla. Whisk together well. 3. In a separate bowl, combine remaining dry ingredients. Stir dry ingredients into the wet mixture; stir just until combined. Gently stir in the pears and the pecans (if using). Divide the batter between the prepared loaf pans. 4. Bake for 45 to 55 minutes, or until a toothpick inserted into the center of a loaf comes out clean. Allow loaves to cool in pans for 10 minutes before moving to a wire rack to cool completely. *To lighten-up this bread a little bit, sub half unsweetened applesauce for half of the oil (1/2 cup oil, 1/2 cup applesauce).